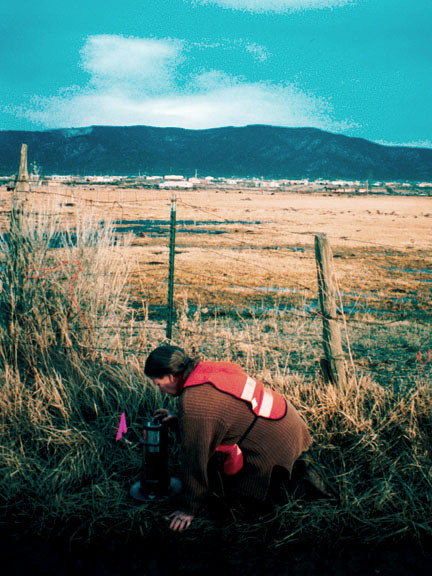 Patricia Dickerson measuring gravity in Taos to 1 part in 100,000,000 (the Worden gravimeter can theoretically resolve 0.01 mGal differences in acceleration --equivalent to one inch of elevation change). Define a suitable survey line in advance of the arrival of each Astronaut candidate group. Produce GIS base maps and aerial photos for each survey line. The morning of the survey, the Astronaut candidates are briefed on the local geology, the chosen gravity method (theory and application), and logistics. Drive to survey location, and distribute orange vests and field gear. Break the group into two teams for the exercise, each consisting of a pair of surveyors and gravimeter teams. Provide brief instruction in field surveying (topo maps, air photos, GPS receivers) and gravity-measuring techniques. From a central base station on the survey line, send teams out along opposite traverses. Survey teams plant flags at 100m spacing using laser rangefinders, and record locations using topographic base maps, air photos, and GPs units. The Gravity team follows behind, recording gravity meter reading and time at each flag. Halfway through the exercise, survey and gravity teams switch tasks. Teams radio data to "Mars Base" (pickup truck at the base station) where they are entered into a spreadsheet on a laptop computer. Geophysicists process the gravity data that evening.